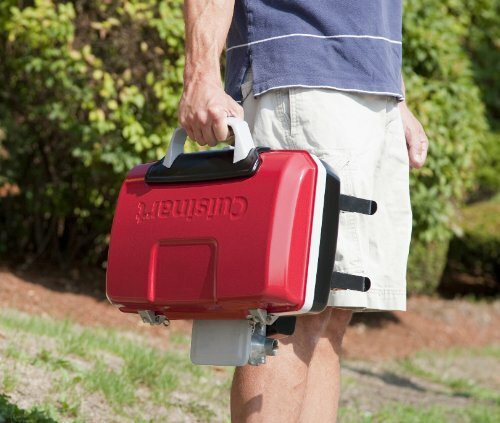 The Cuisinart CGG-180 Petite Gourmet Portable Gas Grill with VersaStand is a great choice for a tailgating use. It includes the VersaStand, which is a height-adjustable telescoping stand, offering a great deal of flexibility in cooking options. It can accommodate food for 4-6 people at one time with its 145″ porcelain-enameled cast iron grilling surface and a 5500BTU stainless steel gas burner which. The burner can quickly heat the grill to more than 500’F, so it has a lot of power. The telescoping legs and stabilizing feet set up in seconds, and the CGG-180 has a lid locking feature to ensure that the unit stays closed during transport. The unit has a briefcase-style handle, weighs 17lbs, and is 20.5″ x 40.9″ x 24.6″ in dimension, so it’s easy to move around in the parking lot or on the go. 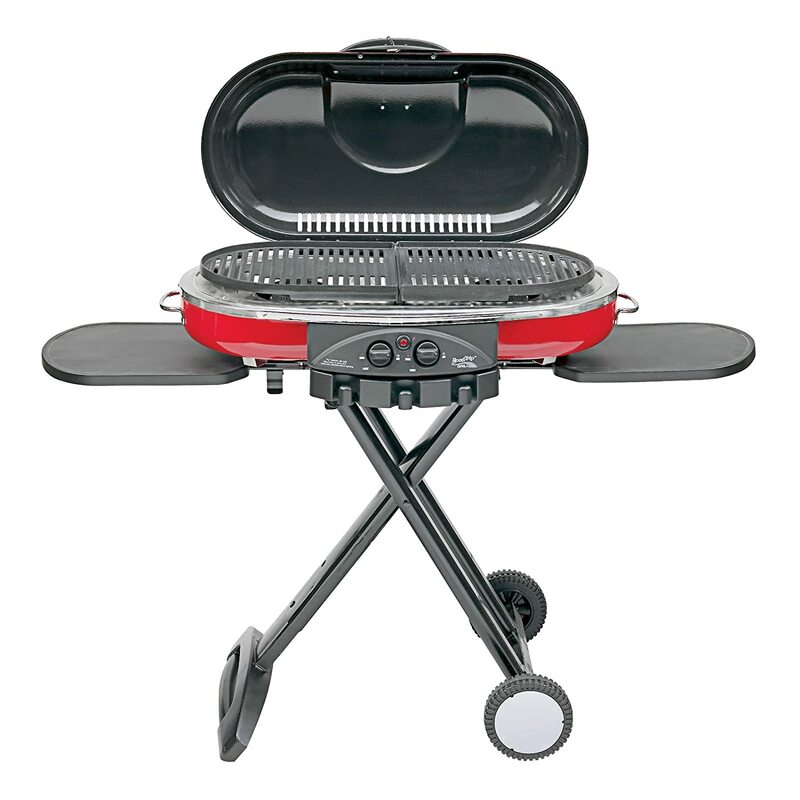 The CGG-180 Petite Gourmet gas grill has a large cooking surface, and can easily accommodate 8 burgers, 8 steaks, 6-10 chicken breasts, or 4lbs of fish at once, making it capable of feeding the gang quickly and efficiently. It is designed to take 14.1oz and 16.4oz LP gas containers (not included), and can be adapted to accept 20oz LP gas containers with the purchase of an additional adaptor hose. As an added bonus, it is available for quick shipping on Amazon Prime, so you can get it in time for the game this weekend! Click here to check the current price on Amazon. 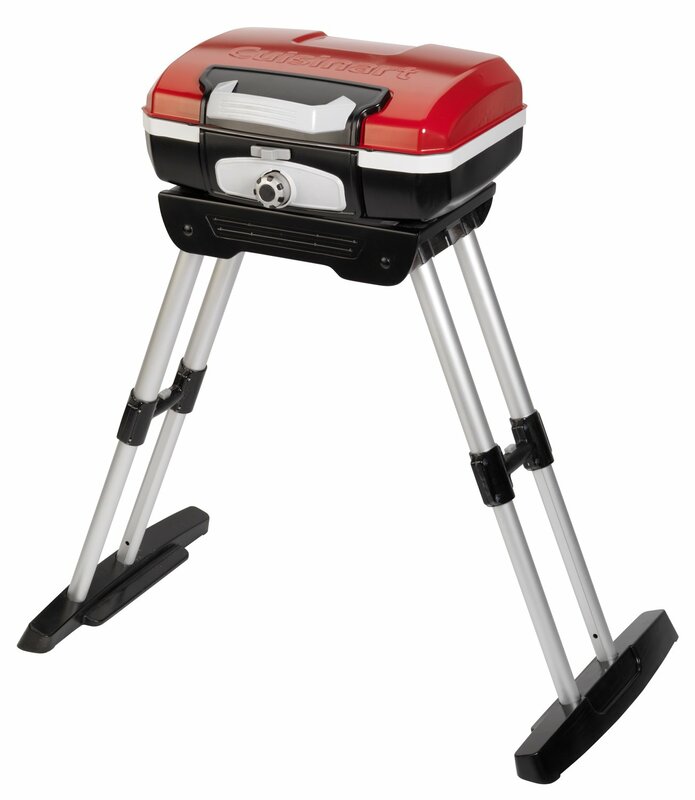 Coleman LXE RoadTrip Portable Gas Grill. 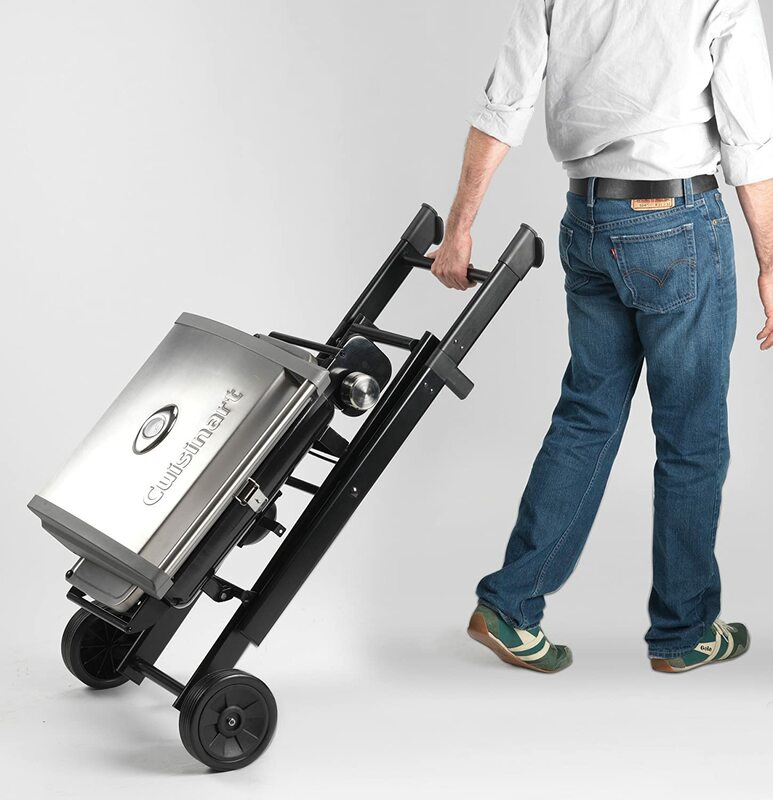 The Coleman LXE RoadTrip Portable Gas Grill is a fine entry into the portable gas grill for tailgating. It is sleek, attractive, and functional, with several color options from which to choose. 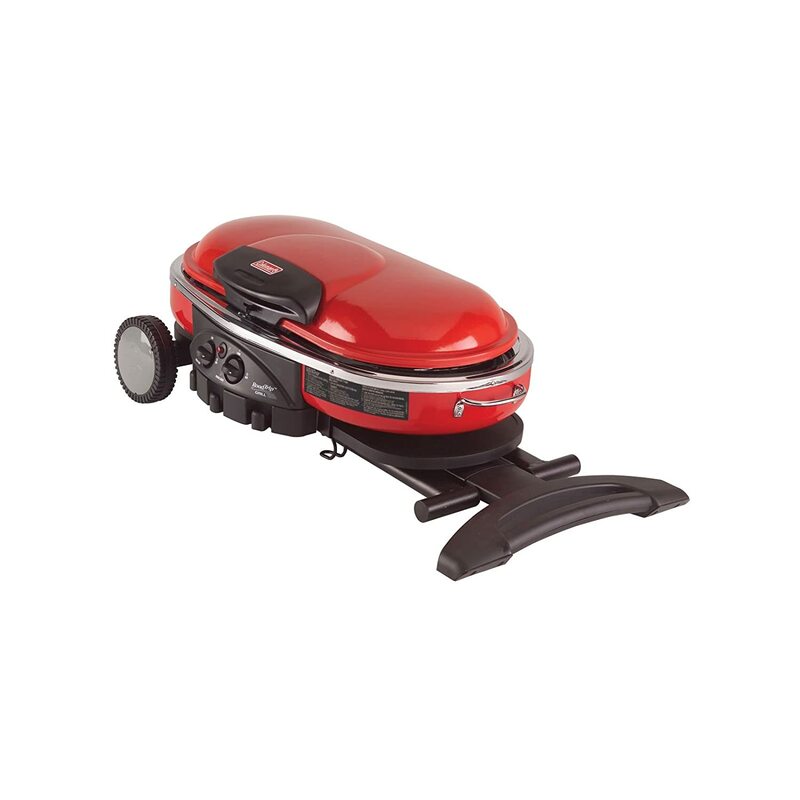 The grill has a large, easy to clean porcelain-enameled cast iron cooking surface, clocking in at 285″, and capable of handling a whole lot of burgers. It also includes two built-in tables, making cooking on the go a breeze. The LXE RoadTrip features a dual burner setup with each burner putting out 10,000BTU of cooking power, for a total of 20,000BTU of heat available. The unit features a pressure control system which helps even out the temperature fluctuations in windy and cold environments, which is a huge plus for sports fans up north! Coleman RoadTrip LXE Gas Grill Folded Up. The LXE Road Trip does include a stand and rollers, making it very convenient to move around and setup in the parking lot or at the beach. The unit is 19″ x 19″ x 33.75″ and weighs approximately 48.75lbs. It is designed to connect to 16.4oz LE Propane cylinders, not included. The LXE does have free shipping, but is not currently available through Amazon Prime. The Cuisinart CGG-240 All Foods Roll-Away Gas Grill is one of the top choices for portable gas grills, and is ideally suited for tailgating. It is portable, folds up easily, and can be thrown in the car, making it ideal for tail-gating, camping, or beach use. 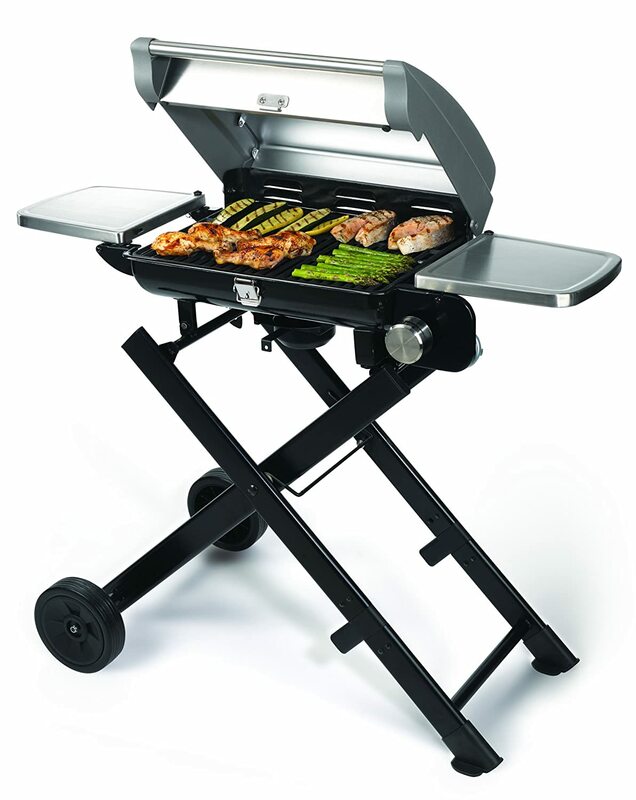 It has a 240″ cast iron grill surface with a powerful 15,000BTU gas burner, an easy-start pilot light system and temperature gauge, and also includes a pair of stainless steel folding tables. 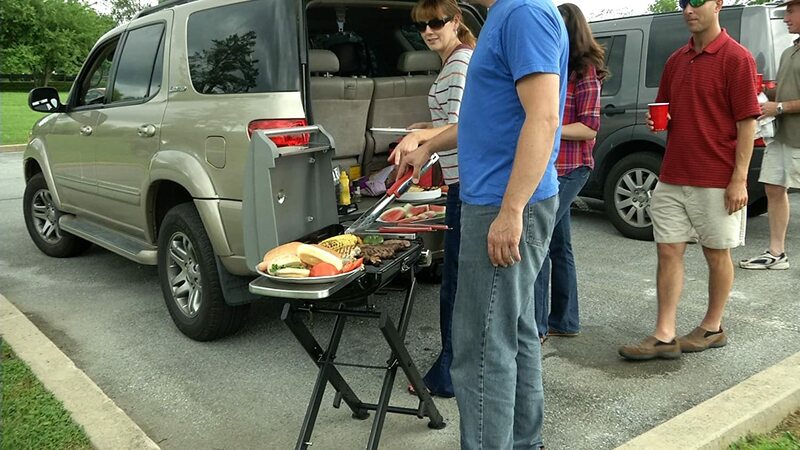 The tables are especially helpful when tailgating, as often extra table space is helpful in these situations. The unit is compact, measuring 44″ x 23″ x 21″ when closed, and 41″ x 23″ x 26″ when open, and it weights 41lbs. The Cuisinart CGG-240 is a great choice for the sports fan on the go, with its sleek stainless steel construction and modern design. The roll-away cart makes this piece very easy to move from the game to the patio to the beach. It is designed to take 14.1oz and 16.4oz LP gas containers (not included), but will also work with 20lb tanks when the optional adaptor hose is hooked up. As an additional feature, the CGG-240 is available through Amazon Prime!